In a move that church observers say sends a signal that the Vatican understands the seriousness of the ongoing clergy sexual abuse scandal, the Vatican on April 4 announced the appointment Atlanta Archbishop Wilton Gregory as the new archbishop of Washington, D.C., an archdiocese whose two previous leaders have been implicated, in different ways, in the ongoing crisis. While Archbishop Gregory has been outspoken in denouncing racism and in advocating for the pope’s pastoral vision, he is perhaps most known for his role heading the U.S. Conference of Catholic Bishops in the early 2000s. He led the bishops’ response to the first wave of allegations, urging U.S. bishops to adopt a zero-tolerance policy when it comes to abuse by priests. U.S. bishops adopted the Charter for the Protection of Children and Young People, known as the Dallas Charter, in June 2002, and later that year they accepted what amounted to changes in canon law to implement a zero-tolerance policy for abuse by priests. Archbishop Gregory was “an outstanding leader” in the early years of the sexual abuse crisis who “understood survivors and he understood the impact of abuse,” Kathleen McChesney, a retired F.B.I. executive who in 2002 established the U.S. bishops’ Office of Child and Youth Protection, told America on April 3. “There were 300 different points of view,” Ms. McChesney said of the early 2000s as bishops debated how to respond to revelations of widespread abuse by priests and coverup by bishops. Archbishop Gregory, she said, helped form a consensus around the need for zero-tolerance and “bring bishops along who may have been skeptical as to the need for the charter,” especially regarding the involvement of lay people. She said then-Bishop Gregory, who led the diocese of Belleville, Ill., convinced the Vatican that the United States needed special provisions in canon law to hold priests accountable for abuse. Archbishop Gregory has been outspoken in denouncing racism and in advocating for the pope’s pastoral vision, he is perhaps most known for his role heading the U.S. Conference of Catholic Bishops in the early 2000s. Thomas Reese, S.J., a former editor-in-chief of America who has lived in Washington for more than a decade, agreed that Archbishop Gregory had been able to persuade some skeptical bishops to take the abuse crisis seriously. And Frank Keating, the former governor of Oklahoma who led the National Review Board from 2002 to 2003, also praised then-Bishop Gregory’s handling of reform efforts. “From the start, Bishop Gregory said zero tolerance, criminal referral and transparency,” Mr. Keating told America, referring to policies that meant priests accused of abuse should be reported to civil authorities. Mr. Keating criticized U.S. cardinals for initially resisting reform efforts, but said then-Bishop Gregory supported the board’s work. “That was an enormous statement of his courage and his sanctity when it came to these issues,” Mr. Keating said. “Even before the scandal emerged in 2002, he had helped resolve a crisis in Belleville by banning all abusive priests from the ministry,” the article said. The Archdiocese of Washington has been rocked by the sexual abuse crisis during the last year. Last summer, allegations of sexual abuse of minors were leveled against Theodore McCarrick, the influential and media-savvy cardinal archbishop of Washington from 2001 until his retirement in 2006. Mr. McCarrick voluntarily resigned from the College of Cardinals and Pope Francis removed him from the clerical state in February. Mr. McCarrick’s successor, Cardinal Donald Wuerl, resigned in October following allegations that he mishandled cases of clergy sexual abuse while bishop of Pittsburgh during his nearly 20-year long tenure there. Despite stepping down, the 78-year-old cardinal continued to manage the day-to-day operations of the archdiocese and stayed on as an advisor to Pope Francis, a member of the Vatican body that helps the pope choose bishops. Father Reese said Archbishop Gregory will have to take this into account when he is installed as the capital’s seventh archbishop. As for his own views on the sexual abuse crisis, Archbishop Gregory said in an interview in 2017 that clericalism continues to impede reform. “It is the ugly face of clericalism that unfortunately still has too much influence in our church,” he told WABE radio. Despite a reputation for pushing for reform, the archbishop has faced criticism related to releasing the names of priests accused of abuse in the Archdiocese of Atlanta. In 2017, he said he was concerned about releasing the names of some accused priests who were deceased or who were not assigned to the archdiocese. But late last year, the archdiocese published a list to its website that included the names of accused priests who fit those categories. A native of Chicago, Archbishop Gregory studied in Rome and then served as a pastor in Glenview, Ill. He was later an assistant to Cardinal John Cody and Cardinal Joseph Bernardin, taught at St. Mary of the Lake Seminary in Mundelein and was appointed bishop of Belleville in 1994. He was installed as archbishop of Atlanta in 2005. Archbishop Gregory has said racism and nativism has managed to “metastasize” in every generation and that they must be confronted anew—no matter how much progress was seemingly made by “giants” in other eras. The Archdiocese of Atlanta is comprised of 103 parishes and missions and includes 1.3 million Catholics, the archdiocese reports. By contrast, while the Archdiocese of Washington will likely give Archbishop Gregory a national platform, it is home to 655,000 Catholics and 139 parishes and missions. Archbishop Gregory has critics, including Catholic traditionalists who believe he is too welcoming to L.G.B.T. Catholics and from some Atlanta-area Catholics upset at plans to build what they said was an extravagant residence and banquet facility, plans he eventually nixed and for which he apologized. 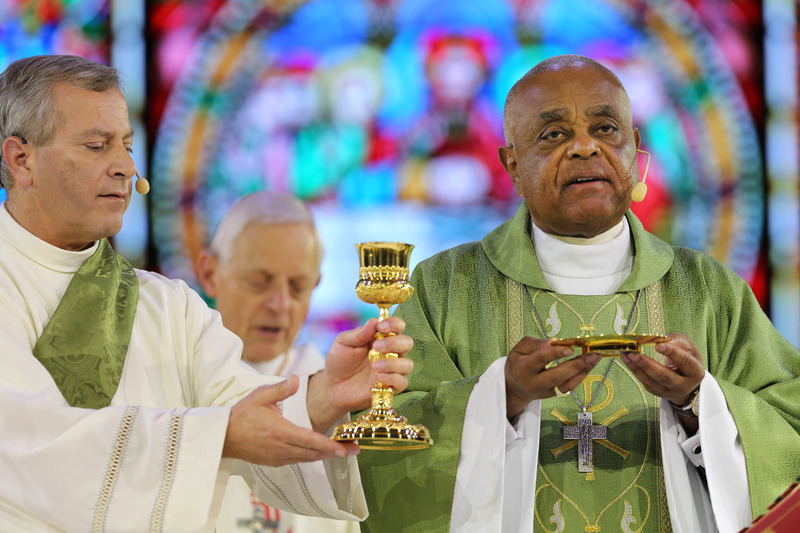 One of a handful of black bishops in the United States, the archbishop has been vocal in confronting racism and xenophobia. In an interview with America last April following a talk marking 50 years since the tumult of 1968, he said racism and nativism has managed to “metastasize” in every generation and that they must be confronted anew—no matter how much progress was seemingly made by “giants” in other eras. And speaking to U.S. bishops at their fall meeting held just days after the contentious 2016 presidential election, Archbishop Gregory urged them to move quickly to address racism in the United States. Archbishop Gregory was an auxiliary bishop to the late Cardinal Bernardin, who promoted the “seamless-garment” approach to social issues, which seeks to infuse the church’s fight for social justice issues with the same energy as the church’s anti-abortion efforts. The archbishop praised the late cardinal in 2000 as “a peerless teacher of the Catholic faith.” More recently, Archbishop Gregory has promoted the pastoral teaching of Pope Francis. U.S. bishops elected Archbishop Gregory to head its worship committee in 2015. In an interview with America last year, he said U.S. bishops might consider reviewing controversial changes made to the translation of the Mass in 2011 in order to make the prayers flow more smoothly. “The original Latin is dense and it has multiple layers of meanings and allusions and to try to unpack the Latin into the English sometimes creates these long, convoluted sentences,” he said. Archbishop Gregory is 71, meaning he has just four years before he is obligated under church law to submit his resignation to the pope. Compounded with the pope’s reluctance to create cardinals based solely on the importance of a diocese, Archbishop Gregory’s age adds another complication to the possibility that he might receive a red hat, which would be a first for an African American prelate. The possible brevity of his leadership in Washington is the only downside of the appointment for Father Reese.